barrel chest a rounded, bulging chest with abnormal increase in the anteroposterior diameter, showing little movement on respiration; seen in emphysema, kyphosis, and chronic airflow limitation. Barrel chest. From Herlihy et al., 2000.
flail chest see flail chest. chest tube a tube inserted into the thoracic cavity for the purpose of removing air or fluid, or both. Chest tubes are attached to a closed drainage system (see illustration) so that normal pressures within the alveoli and the pleural cavity can be restored. These pressures are essential to adequate expansion and reinflation of the lung. Chest tubes are indicated when the normally airtight pleural space has been penetrated through surgery or trauma, when a defect in the alveoli allows air to enter the intrapleural space, and when there is an accumulation of fluid, as from pleural effusion. The effect of excessive amounts of air and fluid within the pleural space is collapse of the lung and the danger of mediastinal shift. Patient Care. It is important that those responsible for the personal care of a patient who has chest tubes inserted understand the basic mechanics of inflation and deflation of the lung, and the purpose of the tubes and their location in each patient. In some cases one tube is inserted higher in the thorax (usually in the 2nd intercostal space) to remove air, and a second tube is placed lower (in the 8th or 9th intercostal space) to drain off fluids. 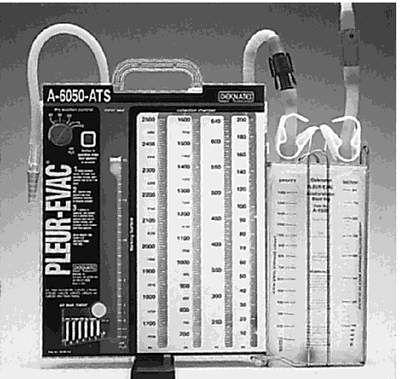 Chest tubes may be connected to a variety of closed drainage systems: a water-seal drainage system with one, two, or three bottles; and a self-contained system such as Pleur-evac. Whatever the type, the purpose of the system is to allow for drainage from the pleural cavity to the outside and at the same time prevent the entry of atmospheric air into the pleural cavity. 1. The bottles and collection apparatus of the system must be kept below the level of the chest to prevent backflow. 2. The lumens of the tubes must be kept open to allow for drainage. If they are obstructed there will be no fluctuation of the fluid level in the glass tube that is connected to the chest tube at one end and kept under water in the bottle at the other end. In the Pleur-evac, the liquid in the chamber should rise on the right side and fall on the left side. If there is evidence that the system is not working properly, this must be attended to immediately. Occlusion of the tubes can lead to a buildup of air and fluids in the pleural cavity and creation of a tension pneumothorax. 3. The system must be a closed (airtight) system. There can be no leaks around connections, and the lower end of the glass tube must remain under water in the bottle. The amount, color, and consistency of the fluid drainage should be checked at least once each hour for the first 24 hours after surgery. The chest tubes should be milked and stripped every one to two hours to assure patency and adequate drainage. The amount of air being removed is indicated by occasional bubbling in the water-seal chamber. Excessive bubbling may indicate air leaks in the tubing. An important aspect of patient care is proper positioning to maintain adequate drainage. The positions allowed and the amount of mobility permitted will depend on the patient's surgical diagnosis, the placement of the tube(s), and preference of the attending physician. Frequent turning, coughing, and deep breathing are instituted on a regular basis to avoid serious pulmonary complications. An exception to the rule of turning is the pneumonectomy patient, who is placed in high Fowler's position and not turned for at least 24 hours after surgery. Chest physical therapy and intermittent positive pressure breathing (IPPB) treatments usually are ordered for all patients with chest tubes. Some patients may require a ventilator during the immediate postoperative period. The patient is observed for signs of respiratory distress and a buildup of air and fluid within the pleural cavity. Early correction of this condition can prevent mediastinal shift. 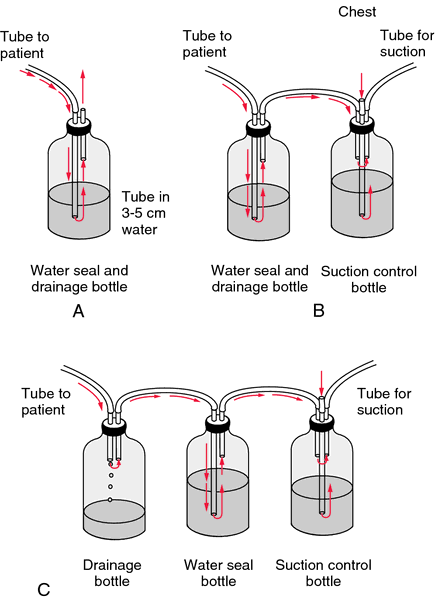 Other signals that demand immediate attention are persistent bubbling in the underwater seal (fluid should fluctuate in the tube as the patient breathes), a drainage through the tube that accumulates at a rate of more than 100 ml per hour, leakage of air at the junctions of the chest tube and tubing and bottles or self-contained unit, and a “putty” appearance caused by the leakage of air into subcutaneous tissues in the upper chest and neck. After a chest tube is removed, the wound is promptly sealed with a sterile petroleum jelly dressing to occlude the opening and prevent entry of air into the pleural space. One-, two-, and three-bottle methods for providing a closed drainage system. A, In the one-bottle system the drainage via the chest tube enters the bottle through the glass tube which has one end submerged under water to form a seal. This provides a one-way valve that prevents a backflow of air into the pleural cavity, which could collapse the lung. As fluid and air from the pleural cavity enter the drainage bottle, the air that is displaced in the bottle is vented through the short tube above water level. B, The second bottle in the two-bottle system acts as a trap to control and decrease the amount of suction within the chest tube. Otherwise, the suction might be too forceful and damage the pleural membrane. No drainage enters this bottle. Its only purpose is to control the force of suction applied. C, The third bottle in the three-bottle system also is used to regulate the amount of suction. This can be done by adjusting the length of the glass tube that is under water. 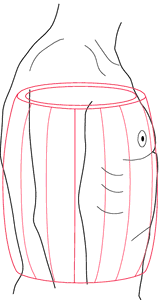 flattening of the chest on either side with forward projection of the sternum resembling the keel of a boat. An abnormality of the thoracic cage that gives a convex appearance to the anterior chest. A deformity in which the chest is peaked forward, seen in people who have suffered from severe asthma from infancy. Also known as pectus carinatum. They don't have pigeon chests, pot bellies, a long body and short bowly legs or even long legs and short bowly bodies.